On our first visit to Universal Studios, we deliberately avoided going into the Harry Potter themed areas. Today we took it by storm. 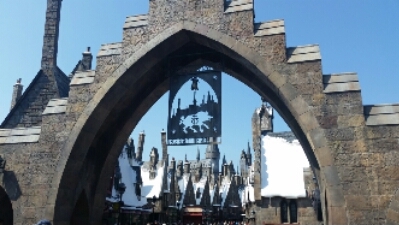 Split across both the main park and it’s daughter, The Islands of Adventure, Hogsmeade has this year been expanded to include Diagon Alley (and it’s shadowy counterpart: Knockturn Alley, which is concealed round the back). We got there as early as we could after an alarm clock malfunction, and piled into Platform 9 and three quarters. The illusion of walking through the wall is cleverly done, and the journey, although brief, was entertaining. The level of immersion presented is frankly jaw dropping. All staff are dressed appropriately and all seem to be huge fans, making the whole experience something like a huge fandom convention on steroids. Lady M was in her element, excited and positively squealing in joy when the music we used for her wedding march (The Quidditch World Cup themes) was played in The Three Broomsticks while we had lunch. Staff in the restaurant were amazed, and claimed she was the most excited person they’d met, which triggered blushes, more clapping, chattering and bouncing up and down. We just had to try the drinks. Charleesi had butterbeer, while I went for the frozen version and Lady M had the pumpkin juice. They were incredibly sweet, and I certainly couldn’t have more than one. To be on the safe side I tanked up on water for the rest of our visit. For food, we attempted the Feast, reasoning that three hungry Maidments could polish off a meal for four. We were wrong. 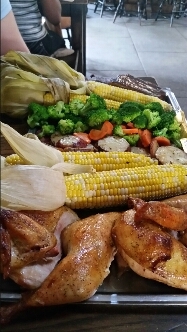 Chicken, ribs, corn on the cob, brocolli, carrots, and potatoes with a mountain of salad were duly brought across to us. It was delicious, though the chicken was just barely a touch on the dry side. The vegetables were perfectly al dente, and the rosemary on the roasted potato was just right. The ribs just melted off the bone and were just sticky enough, while the salad had a light citrus vinagrette that lifted it perfectly. There was just too much to eat comfortably, so we conceded defeat before rolling back out to continue exploring. 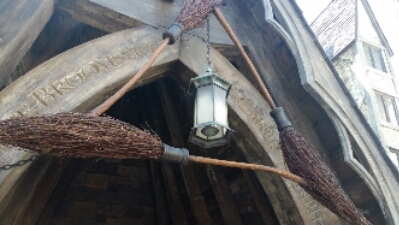 The rides in Hogsmeade are great. We loved trying both the blue and red dragon rides as there were only five minute waits. Our favourite was the swooping blue dragon course. The flight of the hippogriff ride was fast, along the lines of a runaway train ride, and the 3D immersion of Escaoe from Hogwarts actually had the girls screaming between the spiders and dementors. I’ll admit to shuddering a bit at the dementor attack too. We browsed the shops a bit to pick out what we might like to get for family presents and then got back on the train to Diagon Alley. Different animations played on the journey back to the Universal Studios end of the track, keeping us distracted as we pointed them out to each other. Then, a quick sidestep left out of the station into a concealed entrance and we were in the newest section. 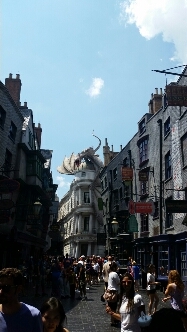 If we’d thought the immersion in Hogsmeade was pervasive then it had been taken up a notch for the Alley. There is no way to see the rest of the park from this area, and at roughly double the width and about one and a half times the length of the street set at the Watford studios, the main street just swallows the crowds. When you factor in the side streets and the shops, you suddenly realise there’s a huge area associated with it. We’d heard that the queues for the Gringotts ride were still hovering around the three hour mark as a minimum so we’d decided not to try it this year, but then we saw the wait time listed as 75 minutes, so we just went for it. A combination of rollercoaster and 3D projection, I just can’t stress how much fun it was. 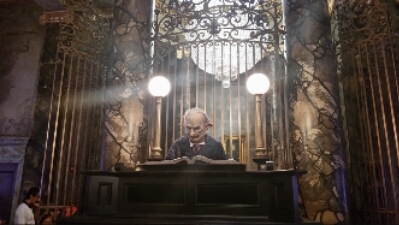 The Hogwarts ride felt longer, but the Gringotts immersion and effects are both superior, down to the animatronic goblins that glower at you while you queue and are very good likenesses of the original actors. Make the time to try this if you can. Exhaustion was setting in by now, so we decided to call it a day and return tomorrow to finish it off. Frankly, Universal could close the two outer parks and still have enough with the Harry Potter material to keep it a multiday visit attraction. 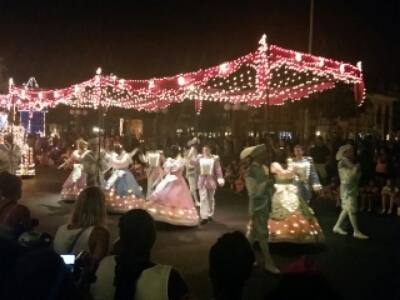 This entry was posted in family, holiday, travel and tagged Disney, family, food, Harry Potter, Magic Kingdom, parades, rides, travel, Universal. Bookmark the permalink. One day will never be enough, I’ll be sure to have a few days allocated when I get there one day.